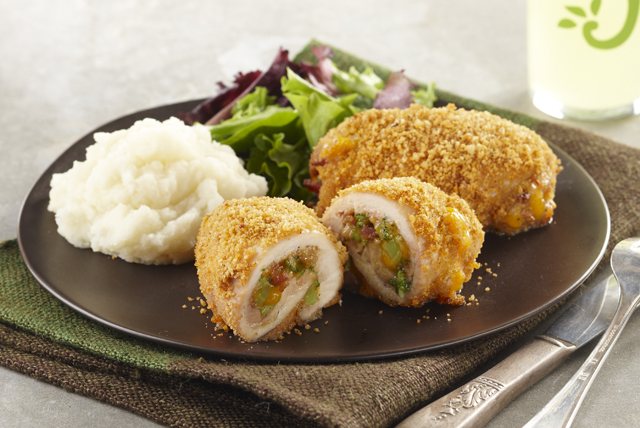 You might see something like these broccoli-cheddar chicken bundles in the freezer section—but they're so much tastier when you make them yourself! Place chicken, smooth sides down, on work surface; top with broccoli, cheese and bacon. Roll up each chicken thigh tightly, starting at one short end; secure with wooden toothpicks. Roll in coating mix until evenly coated. Place, seam-sides down, in single layer in shallow foil-lined pan. Bake 25 to 30 min. or until chicken is done (165ºF). Remove and discard toothpicks before serving. Serve with a mixed green salad and hot mashed potatoes. Place bacon on double-layer of paper towels on microwaveable plate; top with another sheet of paper towel. Microwave on HIGH 3 to 3-1/2 min. or until bacon is crisp.